For grassroots environmental rights defenders across the Global South, the work of protecting ecosystems is becoming increasingly dangerous. Urgent Action Fund and numerous investigative reports like this one from Global Witness have documented an increase in deadly violence against people defending their land and environmental rights. This morning the Grassroots Climate Solutions Fund presented new grantmaking strategies to support Global South grassroots environmental rights defenders at the Environmental Grantmakers Association’s Fall Retreat. Global Greengrants, Grassroots International, and Thousand Currents were on hand to welcome Bertha Isabel Zuniga Cáceres of COPINH, or the Civic Council of Popular and Indigenous Organizations of Honduras, and Roggerio Honh of MAB, or the Movement of People Affected by Dams in Brazil. 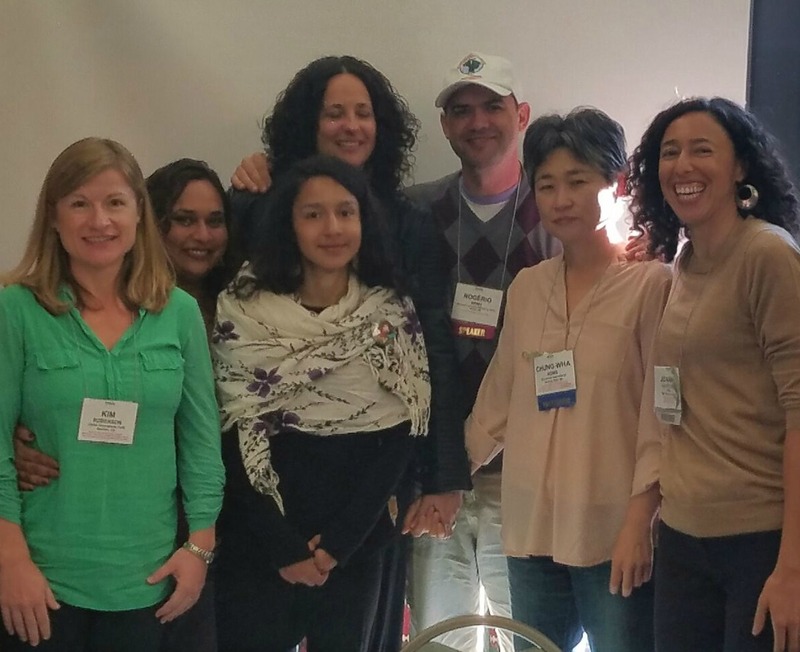 L to R: Kim Roberson of Global Greengrants, Rajasvini Bhansali of Thousand Currents, Bertha Isabel Zuniga Cáceres of COPINH, Jovanna Soto of Grassroots International, Rogerio Honh of MAB, Chung Wha of Grassroots International, and Joanna Levitt Cea of Thousand Currents at the Environmental Grantmakers Association retreat in Grand Teton National Park in Wyoming. Bertha provided a moving and fierce tribute to her mother, Berta Cáceres, an indigenous and environmental rights activist and Goldman Environmental Prize winner, who was murdered in her home in March earlier this year. This woman, my mother, she continued fighting against all oppressions. Her heart had no frontiers,” said Bertha. What is our responsibility in the face of this devastating international trend? How can we better support our grantees in the Global South who are doing this brave and high-risk work—including investing in new forms of collaboration among funders? And how can we leverage our position as philanthropists to push for accountability for these threats and violence upon activists? Grassroots solutions to climate change come from working directly with families and communities as they cope with climate chaos and environmental threats, recognizing the wholeness of people’s lives. That’s why we do it. That’s why we invite other grantmakers to join us.